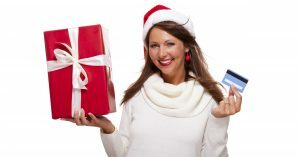 Credit card acceptance is mandatory during the holiday shopping season. That’s the way we see it and we make no bones about it. Simply put, a cash-only business is asking to be left out in the cold this time of year. Consider the fact that spending is at an all-time high all throughout Canada right now. But can everyone really afford to be spending that much money? The truth is that most Canadians prefer to pay for their holiday purchases on their credit cards because they can’t afford to pay for everything all at once. Credit cards, as you know, enable consumers to pay for their purchases over time, if necessary. When you become plastic-friendly, you’re essentially telling your shoppers that they won’t go broke shopping in your store. Consumers get more than their purchases when paying with credit. Another major reason consumers love paying for their purchases with their credit cards during the holiday season is because it helps them rack up the points. Collecting rewards points on credit cards is commonplace. And there’s no time like the holiday shopping season to utilize credit cards to accumulate as many points as possible. By making it possible for your customers to significantly grow their point totals, you increase the chances of making more sales. Make things easy. Those three words are arguably the best possible advice a store owner can be given during the holidays. When customers are placed at ease by the policies of your store, they tend to buy from it. Most people don’t want to carry any cash on them or have to run to the ATM in order make purchases. Accepting credit cards makes holiday shopping so much more convenient. Shoppers enjoy extended warranty protection thanks to their credit cards. With all of those extra purchases, it’s easy to go over budget. Most shoppers try to avoid overspending by denying the additional insurances that many retailers offer them on their big ticket purchases. This is especially true for electronics. When customers use their credit cards, however, they can waive such coverage worry-free. Many credit cards over extended warranty protection – and it comes in very handy at this time of year. At Canadian POS, we highly recommend upgrading your POS system to the Poynt Smart Terminal. For more information about this revolutionary solution, call us at 1-877-748-2884 or email us at info@cdnpos.com.